The item fits for 15FT trampoline. 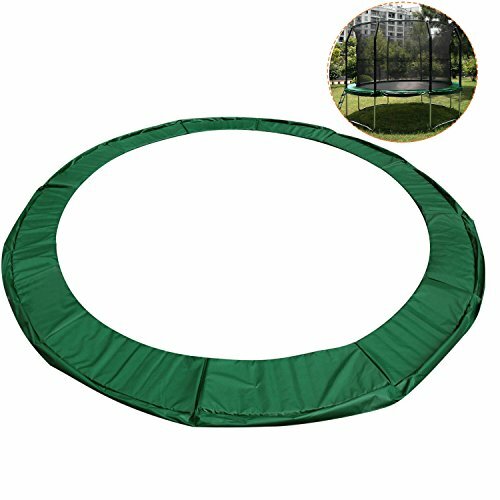 (The size refers to the whole diameter of the trampoline frame is 15FT, not the diameter of the jumping mat). Abundant supply, reasonable in price, prompt in delivery, Customers first. We provide the all-around after-sale service for every customer to achieve utmost satisfaction. If you are not satisfied with our products, please let us know, and we will assist you within 24 hours. Your satisfaction is our main priority. √Trampoline safety pad ensures that you and your family do not get pinches and scrapes, It protects the jumper from falling on the steel frame or getting hurt from the springs. √The UV resistant outer layer shell is manufactured with high density PVC on top and heavy duty PE on the bottom, EPE filled foam, waterproof and mildew resistant. Anti-fungal, Anti-bacterial and UV Treated Coating. √15mm thick EPE Closed-cell foam Inside for shock absorbent platform, fit 15ft circular trampolines. √100% refund if the products couldn't meet request. Directly SHIP from US Warehouse, it will be arrived in 3-7 days when you place the order. Save your time. √Package Includes : 1 x Trampoline Safety Pad. Designed to prevent users from falling through the springs or hurting themselves if they fall on the frame. If you have any questions about this product by Cheesea, contact us by completing and submitting the form below. If you are looking for a specif part number, please include it with your message.